Loaded with entertaining possibilities. Perfect for anyone who enjoys apps, games, music, movies, TV shows, books, and more. 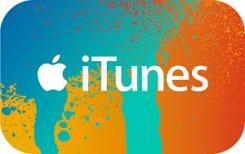 Redeemable on the App Store, the iTunes Store, the iBooks Store, and the Mac App Store. Recipients can access their content on a Mac or PC, iPhone, iPad, iPod, and Apple TV. TM and © 2017 Apple Inc. All rights reserved. Apple is not a participant in or sponsor of this promotion.